After I finished my last post, the quote above was on my homepage as an encouragement to reach my 90th post (this one!). 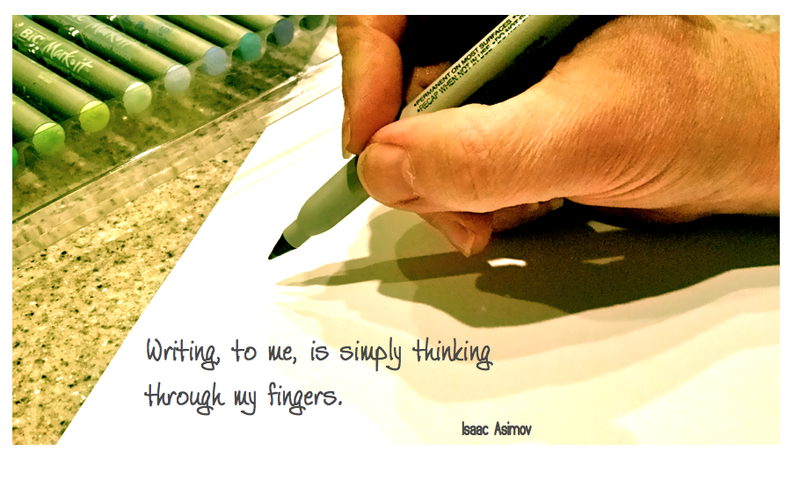 I hadn’t thought of it quite like that before, but when I post on here, “thinking through my fingers” is exactly what I am doing. I love those of you who ‘like’, tweet, comment or email as a way of letting me know how the post I just wrote has had an impact on you. Really. Love it! Even more though, I like getting my thoughts down, saving access to the links I have found, thinking through the latest thing I have just read and challenging my own position as a 21st century educator. I have never been great at sticking with things. Typically, I am excellent at starting things but my enthusiasm tapers and then a new project is born. This forum for ‘thinking through my fingers’ has been a great source of encouragement for me and a great way to sift through the mountain of awesomeness that exists in education right now. Perhaps it will work for you? What do you have to say? Congrats on your 90th post! Although I’m not one for commenting I have loved reading all of them! They’re inspiring, thought provoking and making school different! Thank you!!!!!! Thanks Treacy. I realized that of the blogs I regularly follow, rarely do I comment either – although I really take in what they have to say and often find myself applying their wisdom elsewhere. I definitely think of people like you – and your kids – in my quest to make school different! Here’s to the next 90!